If you've been looking for a way to help people in need and to have a more personal connection, DonorSee might be the answer for you. 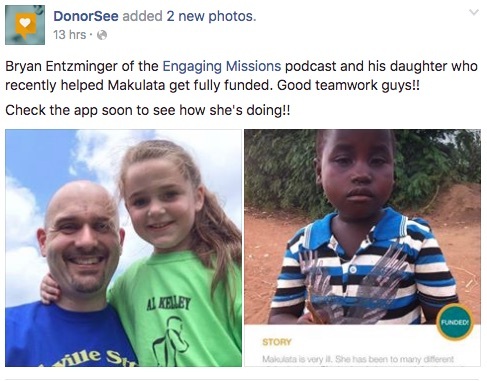 I heard about this a couple of weeks ago on the Bad Missionary Podcast. It's a fairly new podcast on my list but I listen regularly and enjoy it. Anyway, Gret (the missionary) is in the process of launching DonorSee. I think it's probably the perfect blend of micro-giving, personal connection, and built-in accountability. It's an app. A platform. A way to connect with people in need. People who missionaries and aid workers know have needs. And to help fund what they need. It could be $30 for medicine. Or $200 for the wood to make pews for a church. Or any number of other things. The small projects. The overlooked people. The opportunities to come together and make a powerful difference in the Kingdom. And in somebody's life. And what makes it cool is that, because it's a platform, not a huge organization, you can hear back about what's going on. Personally. From the aid workers and missionaries. You might see a video or a photo of them receiving the medicine they needed. Who knows? And because the updates are provided directly by the missionaries and aid workers, there aren't any long delays. No form letters. Not that there's anything wrong with those. But if you want to be able to make a significant difference for a small amount of money, know that the needs are real, and to hear back about what's going on, DonorSee is probably for you. We've been teaching my daughter about money. One of our friends gave us a Dave Ramsey piggy bank (it's called something else). She's been saving, spending, and giving. Well, she wanted to help. So we took some money of ours, put it together with what my daughter had saved (to give), and made a donation. We didn't cover all of the need. But we covered the last few dollars. At least not for us. Not right now. Because we've put a little of our treasure with this little girl, a little of our hearts goes with it. We care a little more. And we have an opportunity to live our faith in front of our children. And – yes – to make a difference in the life of a little girl who needs some medicine. And maybe to glorify God a little. Take a minute to check out DonorSee. Visit the website at DonorSee.com. Download the DonorSee app and at least check it out. And give them a like on Facebook.